For those who have been waiting for this recipe since my Instagram photo, here it is! You will need a good blender that can handle frozen fruit, but besides that it takes 7 minutes and tastes delicious! Great as a gluten and dairy free dessert or snack, and you can keep it in a freezer friendly container afterwards, or in the fridge to keep frothy! I made this version with all organic ingredients, including the sugar, however I’m going to be practicing an alternative using honey, agave, maple syrup, or a mix… I’ll keep you posted with a new recipe once I’ve perfected it without sugar! Put the sugar in a blender and mix on high until finely ground. Add the frozen strawberries, lemon juice and egg white into the blender and mix for 20 seconds on medium-high. Scrape down the sides and blend again for another 20 seconds on medium-high. Pour mixture into a large bowl and using an electric whisker, whisk for about 3-4 minutes, until frothy and hardened enough to spoon into individual dishes to serve. Garnish with a pinch of left over chopped basil (or dried basil, if you forget to save some of the fresh basil like I did), and enjoy! 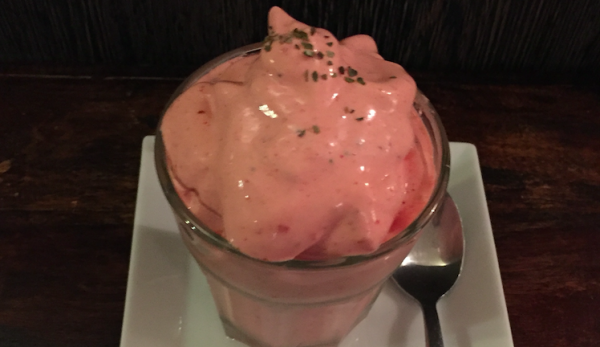 Variation: Strawberry & Mint Foam – use the same amount of fresh or dried sweet mint, instead of basil.